Well, I’m now 3 days away from my first triathlon. It’s a light one. 400 yd swim, 11 mile bike, 3.1 mile run. Really, I figure it’s there to prepare me for PG. I had this old mountain bike that was inherited from Rachel’s little brother. I new that just wasn’t gonna cut it for the long rides I’ve been starting to take. So I borrowed a bike from my friend Jono. He used to use it to tri, but it’s been in his garage for like 10+ years. No lubing or anything. Just put it all together and added some extras he already had on the side. Allow me to give you the quick tour. Carbon fiber frame. Nowadays, they make the whole thing carbon fiber, but this is a nice start for me. Light for speed. Of course, I discovered when I rode with the Ryan’s a few weeks ago, it doesn’t go fast just cause of the carbon fiber. You actually have to be in shape and pedal fast, too. Bummer. 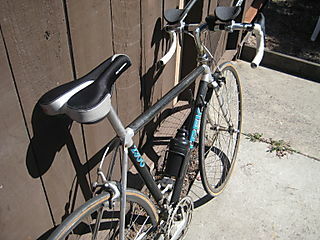 Aero bars. He had those and I added them to the bike. Those allow me to hunch over and get that cool “Hey I’m a triathlete” look as I become more aerodynamic. Again, probably overkill for my skill level, but it sure does make me feel cooler. Those tires are still about 20 years old, but they do have new tubes in them. 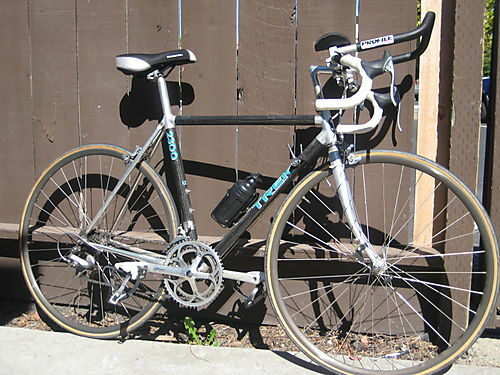 this was my first experience with presta valves. Our hand pump was able to be modified to fit. 120 PSI is what the tires call for. Had no gauge. The first night I rode they were probably at like 15. I pumped em up as much as I could with the hand pump and did a couple rides, including the 26 mile coastal ride. Then I got a pump with a gauge. They were at about 60 PSI. Bike CPU. You’ll notice in the pic below the CPU on the handlebars to give mileage and what not. Yeah. It’s old and doesn’t work at all. Trying to get my hands on one from another friend. Cages. Not even sure they still make shoes for the no clip pedals on there anymore. But I didn’t want to buy pedals or shoes. Luckily there were cages to put on there. Those are nice for tough rides! Bike seat. That’s a seat I bought for the last bike. Moved it to this one. A little padded and of course has the jewel groove. I’m stoked to have a decent road bike for these next couple triathlons after spending half a day with the bike fixing it up. Still needs new handlebar tape and will definitely want to get it tuned up for the P.G. triathlon – Olympic distance. Also need to get some tri shorts, but I don’t think I’ll be able to do that before Saturday. Not sure if they’re sold around here anywhere. So there you have it. One of my tools of the trade. Wish me luck this Saturday! I’m sure you’ree get the update! Bobby you’re awesome. I’m truly impressed in spite of all the banter I throw your way. Jed – Olympic is typically 1500 meter swim, 26 mile bike, and 6.4 mile run. Maureen – Ha! Not so much! Great cruisers. Not so great tri bikes! Ed – Oh I dunno, either the fact that I wanted a road bike, or more importantly the fact that it has 3 gears. But it’s supposed to be a 21 speed. Oh yeah, plus we used it on July 4th, and it has a flat tire now. Linda – Thanks for the vote of confidence! Too funny…..good luck. I’m not sure you’re ready for a tri, but, hey, at least you’ll look cool. You never cease to amaze me. What was wrong with the bike I let you use? You didn’t want to try using one of the bikes we brought back from India?